A still image from the first movie captured by the IRIS solar observatory, 21 hours after mission controllers opened the telescope’s door. NASA's newest solar observatory has taken its first photos of the lowest layers of the solar atmosphere, a mysterious and little-understood region of the sun. The images, taken just 21 hours after mission controllers first opened the telescope’s door, reveal new details of the sun’s lower atmosphere — an area known as the "interface region." The IRIS spacecraft (short for Interface Region Imaging Spectrograph) captured images of thin magnetic structures and streams of material in the solar atmosphere. These early observations suggest tremendous amounts of energy flow through the interface region, according to NASA officials. The door covering the IRIS telescope was first opened on July 17, allowing it to take its first photographs of the sun. These photos showed thin, fiberlike structures that have never been seen before in the solar atmosphere, NASA officials said. This image compares observations from the Solar Dynamics Observatory (left) and the IRIS telescope (right). 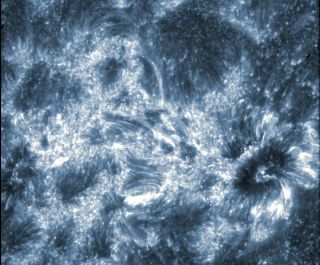 IRIS also observed vast differences in density and temperature throughout the sun's interface region, even between loops of solar material located only a few hundred miles apart from each other, the scientists said. The spacecraft also captured spots that appear to blink — rapidly brightening and then dimming — which could indicate how the energy is being transported and absorbed in this area of the sun's atmosphere. Energy that flows through the interface region may help power the sun's dynamic atmosphere, and heat the upper layers of the solar atmosphere to scorching temperatures of about 1.8 million degrees Fahrenheit (1 million degrees Celsius), NASA officials explained. The features observed in the lower layers of the sun's atmosphere may also drive the solar wind, which flows through the entire solar system. During powerful solar storms, the streams of charged particles that make up the solar wind can knock out satellites in their path, causing power grid failures and disrupting GPS services. During its two-year mission, IRIS will closely study the sun's interface region, where most of the star's ultraviolet emissions are generated. The spacecraft will examine how solar material moves, gathers energy and heats up as it travels through this part of the lower atmosphere. Artist's concept of the Interface Region Imaging Spectrograph (IRIS) satellite in orbit. The sun-observing telescope is launching in June 2013. The spacecraft's telescope, which is a combination of an ultraviolet telescope and spectrograph, is designed to capture high-resolution images every few seconds, and can zero in on areas as small as 150 miles (241 km) on the sun, NASA officials said. The onboard spectrograph analyzes the sun's light, splitting it into various wavelengths and measuring how much of any given wavelength is present. Over the next few weeks, scientists will inspect the IRIS data to ensure that the spacecraft's instruments are performing well. So far, mission managers are impressed. "The quality of the images and spectra we are receiving from IRIS is amazing — this is just what we were hoping for," Alan Title, IRIS principal investigator at Lockheed Martin in Palo Alto, Calif., said in a statement. "There is much work ahead to understand what we're seeing, but the quality of the data will enable us to do that."